Are you serious about recording the amount of precipitation in your area? 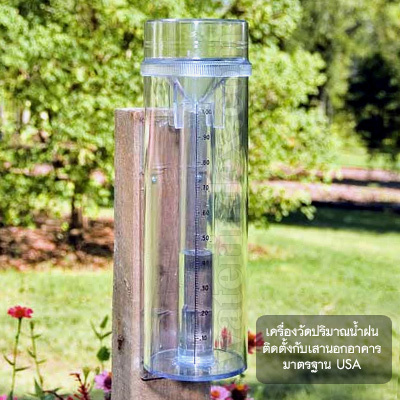 This is the rain gauge that the United States Weather Bureau recommends and usages for Professional record keeping which they supply with their weather watcher kits used around the world. It is manufactured to the Weather Bureau specifications and is extremely easy to read and is accurate to the nearest 1/100th of an inch. To measure sleet or snow just remove the top funnel and let it collect - empty the collected sleet or snow, after it melts, into the inner measuring tube to measure the water content of the sleet or snow. - วัดระดับน้ำฝนสูง 30 ซม. และปริมาณน้ำฝนรวม 254 มม. - ขนาด : สูง 35.50 ซม, เส่นผ่าศูนย์กลาง 10.50 ซม.